As Christians, we know that God’s image in each person, and God’s call to holiness form the basis for human dignity. Our duty is to protect this human dignity, especially in the most vulnerable among us, our children. It is essential that they find a safe environment in our homes, in our schools, in our worship communities, and in the general community. Sexual abuse of a minor is a sin and a criminal act, which causes enormous pain, anger, and confusion. 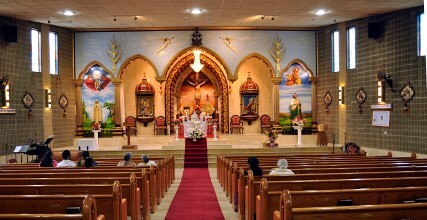 In order to protect the children and young people of the St. Mary's Knanaya Catholic Parish, Morton Grove from such abuse on the part of personnel acting in the name of the parish, this policy addresses the need for prevention, reporting and investigation of allegations of sexual abuse of minors. It endeavors to provide a means of outreach to those who have been abused and the communities who are harmed by the abuse. 1. To promote healing and reconciliation with victim survivors of sexual abuse. 2. To guarantee an effective response to allegations of sexual abuse of minors. 3. To ensure the accountability of our procedures. “Dioceses/eparchies will establish ‘Safe Environment’ programs. They will cooperate with parents, civil authorities, educators, and community organizations to provide education and training for children, youth, parents, ministers, educators, and others about ways to make and maintain a safe environment for children. Dioceses/eparchies will make clear to clergy and all members of the community the standards of conduct for clergy and other persons in positions of trust with regard to sexual abuse.” This guideline, which mandates that all dioceses create a safe environment for children and young people who pray, study and worship in our schools and churches, is the basis for our diocesan safe environment programs. St. Thomas Syro-Malabar Catholic Diocese of Chicago’s efforts for prevention will focus on screening and education. 1. All Diocesan clergy, religious, Seminarians, lay employees, and regular volunteers who have contact with minors must be screened according to diocesan guidelines. 2. All such personnel will participate in education through the diocesan sexual abuse awareness and prevention training program. 3. Education of minors and adults will be offered in our Parish. Anyone sexually abused as a minor or who knows about a case of sexual abuse of a minor should immediately report it to the civil authorities. When such sexual abuse has been committed by a cleric, religious, seminarian, diocesan or parish employee or a diocesan or parish volunteer it also should be reported to the Bishop of St. Thomas Syro-Malabar Catholic Diocese of Chicago through the Committee for Sexual Abuse Investigation at (630) 474-5172. Reporting can be made at any hour of the day. The Diocese/parish will cooperate with investigations by appropriate civil authorities. In addition, all cases of sexual abuse of a minor committed by Diocesan/parish personnel will be investigated by the Diocese in order to provide the Bishop with the necessary information to determine the appropriate course of action. Every effort will be made to maintain confidentiality so as to protect the rights of all parties concerned. The Diocesan response to both victim and alleged offender will be to pursue justice with tenacity while also pursuing mercy with love and compassion. Victims: The healing of victims, their families, and their community from the effects of sexual abuse by church personnel begins when the allegations of such abuse are received. Victims of sexual abuse experience a profound sense of loss and betrayal by someone from whom they had the right to expect protection and guidance. This is even truer when the offender represents spiritual authority and one’s connection with God. As a result, victims frequently have difficulty trusting others, fearful that they will be blamed for the abusive acts. When victims decide to disclose the abuse they can be assured of receiving a welcoming reception that is compassionate and non-judgmental. To accomplish this outreach, they will be contacted by the Victim Assistance Coordinator. Alleged Offenders: An accusation of sexual misconduct is personally devastating. Should an allegation of sexual abuse be made, compassion will be exercised toward the accused and every effort will be made to protect his/her civil and canonical rights; understanding there is a presumption of innocence under both civil and canon law. The Diocese of St. Thomas Syro-Malabar Catholic is committed to providing safe environments and fostering continuous improvement in every organization that sponsors activities and/or provides services to children and youth. Increasing awareness of potentially harmful situations through the VIRTUS training workshops. Empowering adults and children to act before abuse occurs through the Child Lures Prevention for Catholic School and Religious Education students and in Youth Ministry with an Inter-generational Program for families. Evaluating background checks for relevance to the employee’s or volunteer’s position. Implementing a Pastoral Code of Conduct which outlines acceptable and unacceptable behaviors for all clergy, employees and volunteers. GET involved in activities with your child. TEACH your child the correct names for their private body parts. KNOW where your child is and who is with him/her. ENSURE activities are monitored by more than one adult. ALLOW a child to be picked up only by an authorized person. PREVENT abduction by creating a secret password with your child. NEVER leave a child in a building, on a field trip or in a public bathroom alone. MEET with a child only in areas visible to others. ALWAYS monitor access to a child’s activities. BE ALERT to strangers hanging around. MAKE sure enough adults are involved in the programs in which your child participates. TEACH your child what to do if someone makes them uncomfortable. -	Never touch a minor in a sexual way or other inappropriate manner. -	Never be alone with a minor in a residence, rectory, sleeping facility, or any other closed room. - Never share a bed with a minor. -	Never take an overnight trip alone with a minor. - Never introduce sexually explicit or pornographic topics, vocabulary, music, recordings, films, games, web sites, computer software, or entertainment. - Never provide drugs, alcohol, or tobacco to a minor. - Never use, possess, or be under the influence of illegal drugs. - Never use alcohol when engaged in ministering to a minor. - Never engage in physical discipline for behavior management of minors. No form of physical discipline is acceptable. + Report any suspected child abuse to the proper authorities. + Avoid physical contact when alone with a minor. Physical contact with minors can be misconstrued, especially in private settings. + Avoid overnight stays with a minor unless there is another adult present in a supervisory role. + Avoid providing overnight accommodations for minors in private residences or rectories. + Avoid driving alone in a vehicle with a minor. + Refrain from giving expensive or inappropriate gifts to a minor. + Avoid meeting privately with minors in rooms, offices, or similar areas where there is no window or where the door cannot remain open. If one-on-one pastoral care of a minor is needed (e.g., Sacrament of Reconciliation) avoid meeting in isolated locations. + Exercise caution in communicating with minors through e-mails or the internet. + Only share work/ministry related e-mail addresses with minors. Do not participate in chat rooms with minors. + Ensure that all activities (extra-curricular, catechetical, youth ministry, scouting, athletics, etc.) for which you are responsible have been approved in advance by the appropriate administrator. + Have an adequate number of adults present at events. A minimum of two adults in supervisory roles must always be present during activities for minors. + Release young people only to parents or guardians, unless the parent or guardian has provided permission allowing release to another adult. + Avoid taking minors away from the parish, school, or agency for field trips, etc. without another adult present in a supervisory role. Obtain written parental permission before such activities. Permission slips should include the type, locations, dates, and times of the activity and emergency contact numbers. Appropriate affection between Church personnel and minors constitutes a positive part of Church life and ministry. Nonetheless, any touching can be misunderstood and must be considered with great discretion. Depending on the circumstances, the following forms of affection are customarily (but not always) regarded as appropriate. = “High-fives” and hand slapping. = Pats on the shoulder or back. = Holding hands while walking with small children. = Sitting beside small children. = Kneeling or bending down for hugs with small children. = Holding hands during prayer. = Pats on the head when culturally appropriate. # Inappropriate or lengthy embraces. # Kisses on the mouth. # Holding minors over four years old on the lap. # Touching buttocks, chests or genital areas. # Showing affection in isolated areas such as bedrooms, closets, staff-only areas or other private rooms. # Touching knees or legs of minors. # Any type of massage given by minor to adult. # Any type of massage given by adult to minor. # Any form of unwanted affection. # Compliments that relate to physique or body development.